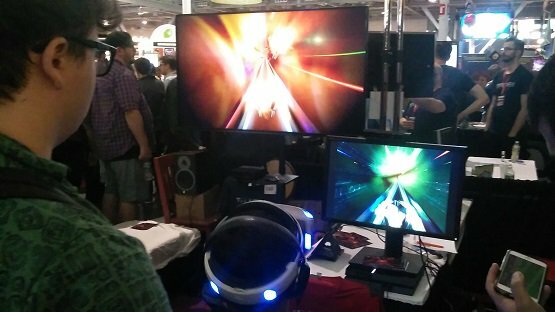 We brought our latest build to E3 and demoed Thumper on PS4 and PS VR. Among the highlights were two award nominations for Thumper from IGN: for Best PS4 game and Best VR Experience! And Thumper won Game Informer's Best Music/Rhythm Game of E3! We'll be at PAX East in Boston April 22 - 24 with the latest Thumper demo. It will be the first time YOU and the gaming masses can play Thumper on PlayStation VR! We'll also have official Thumper tees for sale and free schwag if you stop by our booth. Find us in the Indie MEGABOOTH (booth 4169). Thumper is at Screenshake 2016 , Belgium's only indie game fest. It's this weekend, Feb 19 - 21, in the legendary Het Bos venue. We're honored Thumper is part of the Audio Games showcase on Saturday alongside the magnificent Panoramical! 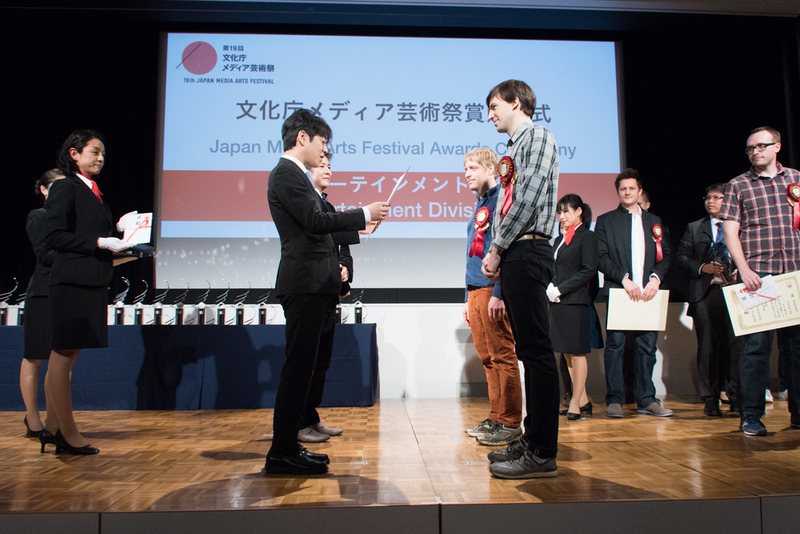 Brian and I spent last week at the Japan Media Art Festival in Tokyo. It was an inspiring showcase of media art, entertainment, animation, and manga set in the beautiful National Art Center in Roppongi. Shorty after arriving, we stopped by J-WAVE radio station for a chat with Sascha about Thumper. 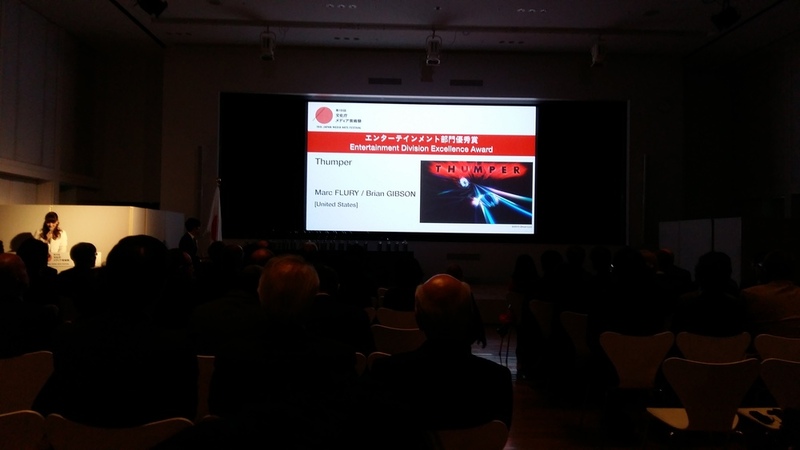 The next day, we were honored to receive an Excellence Award award for Thumper! 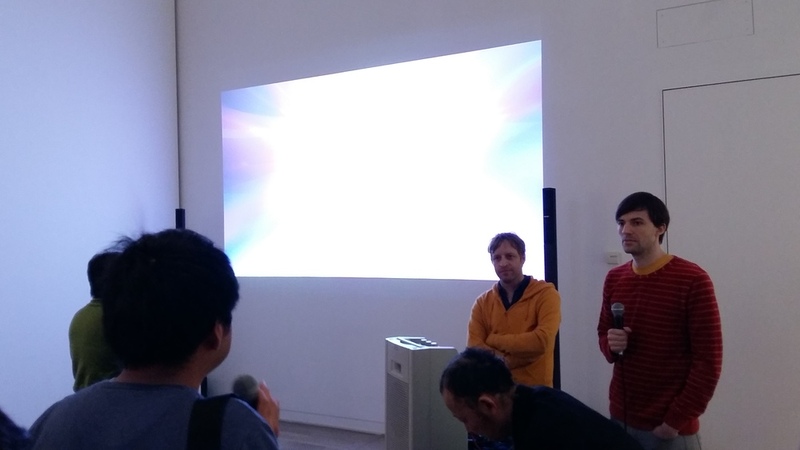 The next evening, we gave a short lounge talk and debuted a new Thumper level at the legendary Super Deluxe performance space. Brian played the game as it was projected on three screens at maximum volume! 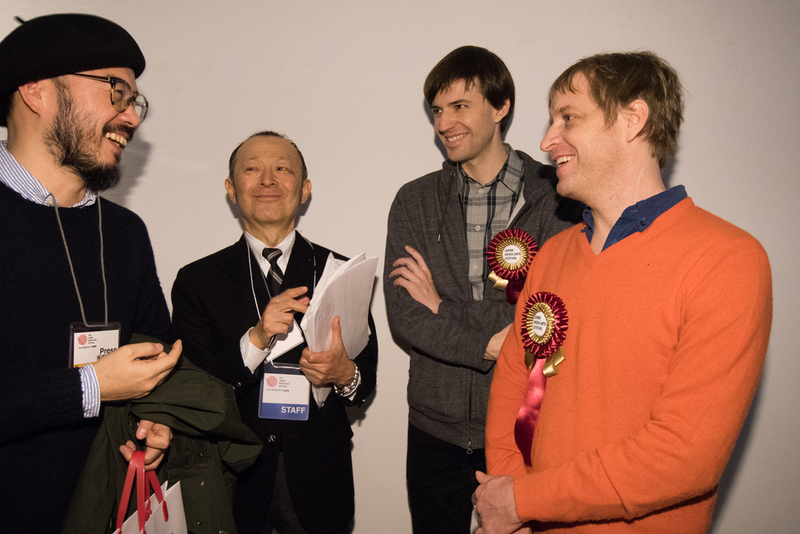 Proceedings concluded with a dancing and clapping session with the inimitable Kishino Yuichi, winner of the Entertainment Division Grand Prize! We also had the opportunity to present Thumper to festival visitors in front of our large screen installation at the National Art Center. 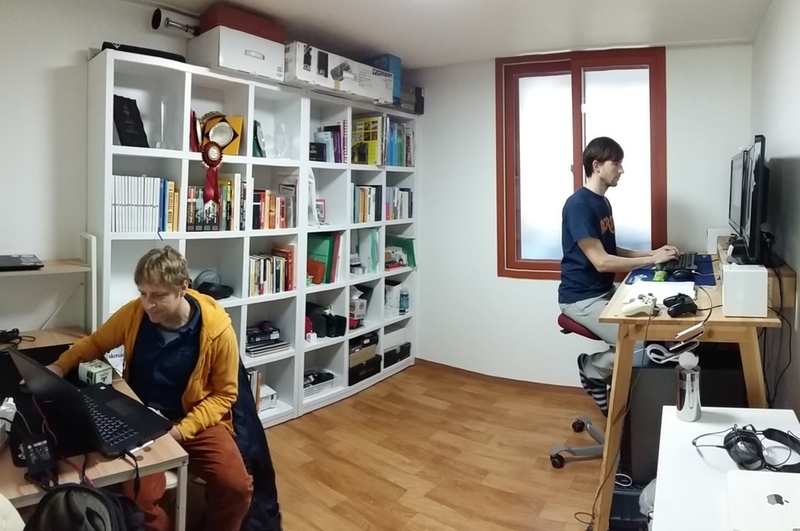 It's rare that Brian is in this hemisphere, so after the festival, we headed to Drool East HQ in Seoul for three intense days of Thumper development. We can't wait to show everyone what we've been working on lately! A few more events before the new year! AzPlay Festival (Bilbao, Spain, Nov 26 - Dec 1) Thumper is nominated for three awards: Best Design, Best Sound, and Best Playability. Slamdance DIG (Los Angeles, CA, Dec 4) Thumper is one of ten games featured in the first ever Digital, Interactive and Gaming at the Slamdance Film Festival. PlayStation Experience (San Francisco, CA, Dec 5 - 6) Play the latest Thumper demo at the premier event for PlayStation gamers. We'll announce more PSX-related news, including the first-ever Thumper World High Score Challenge, soon. Lightning Bolt is touring Europe for the next month. Event page and tour schedule. IndieCade (Culver City, CA, Oct 23 - 25) Thumper is a Night Games selection and will also be playable in the PlayStation booth. IGF China (Shanghai, China, Oct 25 - 26) Thumper is a finalist for the Independent Games Festival China. Day of the Devs (San Francisco, CA, Nov 7) Play Thumper and lots of other special games for one very special evening in San Francisco. G-STAR (Busan, Korea, Nov 12 - Nov 15) Thumper is part of the Busan Indie Connect Showcase -- the first time indie games will be prominently featured at Korea's biggest game show! 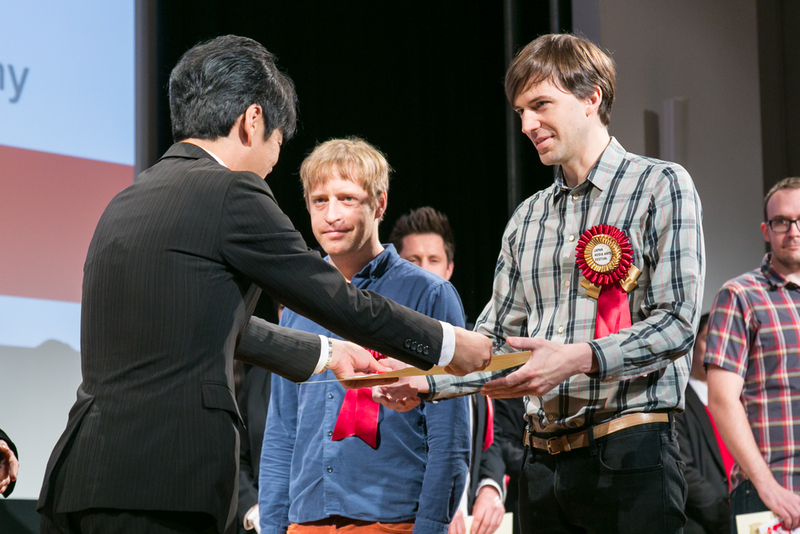 We'll announce one more really exciting event soon! One month, seven events, three continents. Thumper is coming to a town near you! More events will be announced soon. PAX Prime (Seattle, WA, Aug 28 - 31) We won't be attending, but you can play the heck out of Thumper in the Sony PlayStation booth (#222). Busan Indie Connect (Busan, Korea, Sep 10 - 12) Thumper will be shown at Korea's first indie game festival. Marc is also giving a talk about indie game marketing. Basilica Soundscape (Hudson, NY, Sep 11) Brian is giving a special live demo of Thumper at this "thoughtful mix of music, visual art, and literature." Part of the Pop-up Shop lineup. Boston Festival of Indie Games (Cambridge, MA Sep 12) Crakhed returns to his roots for one day in Cambridge, MA! Tokyo Game Show (Tokyo, Japan, Sep 17 - 20) Thumper is coming to Japan's biggest game show in the Indie Game Area (Booth A-61). Strasbourgh Indie Game Contest (Strasbourgh, France, Sep 18 - 27) Thumper is nominated for the prestigious Octoprize alongside 20 other sweet-looking games. It will be playable during the entire festival. EGX Leftfield Collection (Birmingham, England, Sep 24 - 27) Thumper is part of this "eclectic collection of indie games" at the UK's biggest game show. Fantastic Arcade (Austin, Texas, Sep 28 - Oct 1) Play our latest demo in the PlayStation booth. Last month at the IGF, the guys from AREA 5 stopped by our Thumper booth. Watch an interview with us and gameplay footage below. This new episode of CO-OP includes sneak peeks of several cool games, including Downwell, Push Me Pull You, and Firewatch. The Thumper segment starts at the 14:50 mark. We brought Thumper to the EGW at GDC. Watch a live Thumper demo and be inspired by some amazing games! 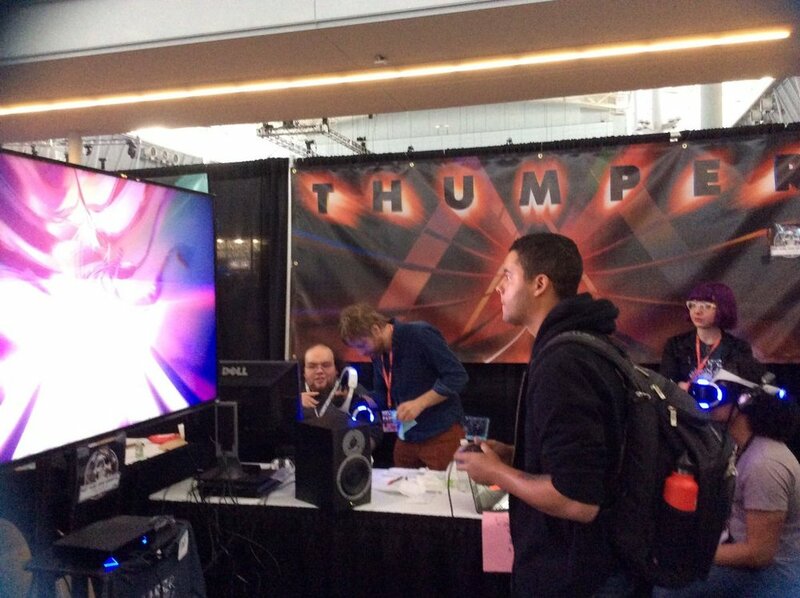 We brought Thumper to PAX East last weekend as part of the Indie MEGABOOTH. Thanks to everyone who stopped by our minibooth! Marc did a live interview and Thumper demo from the PAX expo floor. Click the image below to watch the Thumper segment, but be sure to check out all the other great games from the MEGABOOTH. Thanks to everybody who came to our Thumper live show at Babycastles in NYC on Sunday. The amazing folks at Babycastles made this a really fun night! We just wish we had more pictures from inside the Thumper womb. We're bringing the latest Thumper demo to IndieCade East in NYC this weekend. First, play the demo and give us your feedback during a Show & Tell session Saturday, February 14 from 4 to 6pm. The next night, Thumper will be part of a post-IndieCade party at Babycastles on Sunday February 15 from 8 to 11pm. We demoed the latest Thumper build on the big screen last Saturday in Providence. Our thanks to everyone who came out, played, and gave feedback. And big thanks to the hosts, OTTO BAR/Aurora. This was a lot of fun, the game scales up great which was a nice surprise. Hopefully we can to do more of these live events in the future so don't worry if you didn't make it! Brian is demoing our latest Thumper build in Providence, RI this Saturday, January 17th around 9pm. It's part of OTTO CLUB at Aurora. Here's the Facebook event page. We'll update with some pics from the event.